During her time at Queen’s, Biomedical and Molecular Science Masters student Kathryn Hong (pictured above), has been able to participate in an extremely innovative medical procedure — Canada’s first hybrid cardiac ablation. This surgery is the first of its kind and corrects the most common irregular heart rhythm, atrial fibrillation, which can lead to an unusually rapid heartbeat and a significant increase in the risk of stroke. 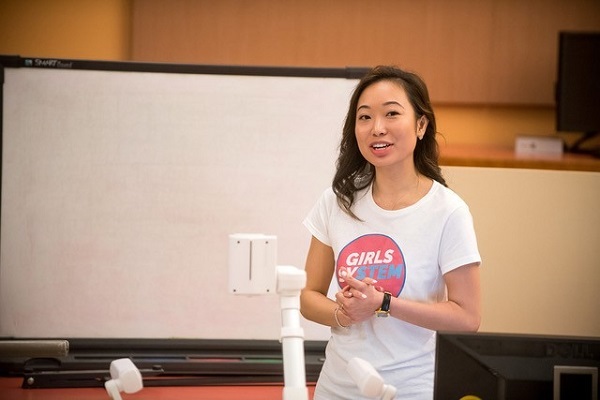 Now, Kathryn has started the Girls SySTEM Mentorship Program which is one of the first STEM-focused professional mentorship programs in Canada. It’s designed for girls in grades 7 to 12 who are interested in pursuing a STEM-related field. Getting hands-on skills from established professionals will help them to feel empowered and expand their knowledge and pursue opportunities available to them. Kathryn’s goal is to create a reproducible model that other communities can adopt and launch nation-wide. Kathryn and her team are already laying the groundwork for a program in Toronto. When you make your gift to the Queen’s Fund, you are opening doors and giving students like Kathryn opportunities to achieve excellence and ensuring a bright future for young women in STEM (Science, Technology, Engineering and Math) research.